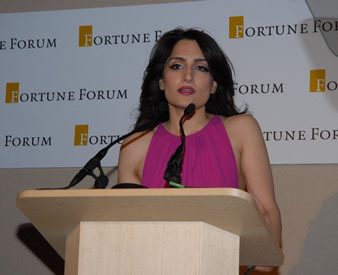 Fortune Forum staged its first philanthropic summit on 26th September 2006 to assist major humanitarian causes and campaigns worldwide, comprising; heads of the world’s largest foundations, global leaders, celebrities and influential entrepreneurs as its members. The Summit is hosted as a Gala Dinner Forum, in an intimate glamorous setting, and notably had a clear philanthropic agenda. The Summit marked the launch of the Club. As the sustainability of the planet becomes increasingly threatened the contributions made by Philanthropists, Private Individuals and Entrepreneurs have growing significance. The Forum exists to provide unique opportunities to bring these groups together, at the highest level, to support key initiatives that address global poverty, climate change and worldwide health. This shared platform is an innovative way of pooling the expertise and resources of some of the world's best NGO’s. This will make our social investment more efficient by saving on event and administration costs. We showcase exceptional and carefully selected identifiable projects which deliver long-term development solutions. Our donor's pledges of support are directed to these measurable projects to make an immediate and demonstrable impact. Fortune Forum is a not-for-profit, non-political organization and so all proceeds from the Forum go to charities, aid organizations and development programs. The Summit is a platform for eminent speakers and music legends to foster generosity, to mobilize international solidarity and to send a message to promote a culture of giving. 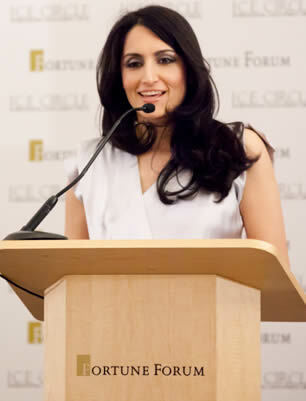 Renu Mehta marked Fortune Forum’s milestone; the $100 billion private-public sector initiative, The MM Aid Model, pioneered with Nobel Laureate Economist Sir James Mirrlees back in 2008 has been kick-started with around £100m of UK funds being raised. The MM Model hallmark ideas such as using aid budgets to match private sector donations have been taken on by Government in the form of pilot projects and will positively impact well over 20 million lives around the globe. 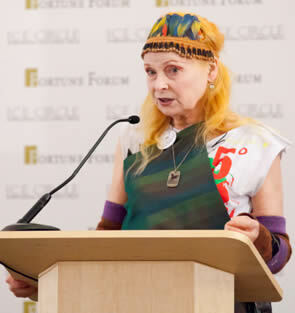 Fashion icon Dame Vivienne Westwood conveyed how frightened she is of the effects of climate change and the danger we all face and that the NGOs rather than governments were doing things to help save the rainforests. She referred to her discussions with Prince Charles and with the deputy Minister of Environment in Lima to help save the tribes who are being victimised and aiding the indigenous people to control their lives. She wore a headdress made by the local Inca people. 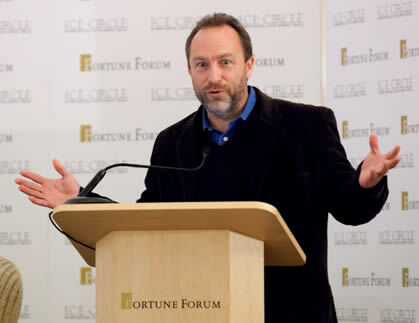 Wikipedia founder Jimmy Wales introduced two of the most influential players in the human rights movement – George Soros and Ken Roth – and the organisation that brought them together – Human Rights Watch. George became one of the most renowned and influential figures in international finance and philanthropy. Since 1979, Soros has established a network of philanthropic organizations dedicated to promoting the values of democracy and an open society which is active in more than 50 countries. 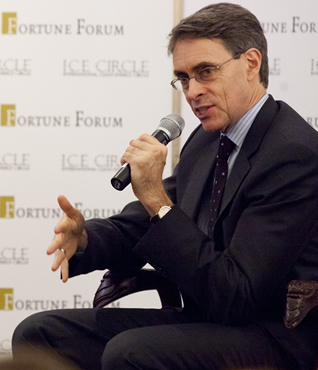 Ken Roth is the Executive Director of Human Rights Watch – for more than two decades he has investigated human rights abuses around the world and has effectively lobbied influential policy makers on the global stage. Ken Roth described Human Rights Watch’s methodologies of defending human rights in around 90 countries where going to court is not a viable option because the legal systems there are unjust. The human rights movement developed to put pressure on governments to force them to defend rights through Human Rights Watch's process of – Investigation where researchers operate in difficult conditions to record violations – The atrocities are then published and translated into policy – Pressure is put on governments by shaming them until they improve their practices – International relations are leveraged to add pressure - Evidence is provided to prosecute violators through international tribunals to stop further atrocities. Ken interviews friend and supporter George Soros on his philosophies behind his philanthropy. George Soros defined his Open Society foundation which holds itself open to improvement in an imperfect society where repression and deficient laws exists. He shared his approach where many of the same principles that enabled him to make money are used to guide his philanthropy: “To re-examine your concept and evolve around it... To take risks from practical experience, mine living through the Nazi occupation of Hungary which was the formative experience of my life and where I learnt to break the rules that didn’t apply…The insistence of philanthropists to have measurements similar to business is mis-guided when it comes to improving the world as there is no common dominator of un-intended consequences.” The political philanthropy he practises has a defining characteristic – to stand up for one’s principles whether you succeed or not in the short-term. He cited Burma and Russia where and he is satisfied with his efforts over the longer term. 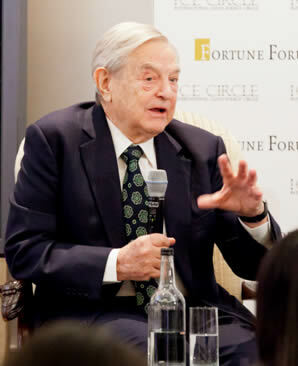 Soros who now spends 95% of his time on philanthropy cited that he did his apprenticeship at Human Rights Watch attending its strategy meetings every Wednesday and has remained involved as it grew in to an effective and large organisation that has not lost its spirit as it has grown internationally; it has maintained its dedication to principles. George’s involvement culminated in his extraordinary $100m 10-year grant to expand its activities world-wide. Renu said that George Soros had pioneered the matching concept and asked him what he thought of the MM Model public private partnership ideas that we have put forward? Soros said that he thought “the idea is excellent because the issues that have to be dealt with, many of them- things like education, poverty, health- are too big for philanthropy. Private initiatives are much more innovative than governments. Governments can benefit from the examples set, and we as a Foundation, have really consciously endeavoured to experiment with ways of improving conditions in a way that could be scaled up and taken over by the government or, in fact, expressly looking for government involvement. As we move towards 2015, she also asked him what he thought was missing from the existing UN Millennium Development Goals framework which are considered to be the most universally comprehensive template to see that the basic needs of the poorest are met. Soros said “Where there are large pockets of misery there is usually political repression and exclusion so it’s important to bring the human rights perspective and link it to the development agenda through the MDG framework. Former South African President F.W. 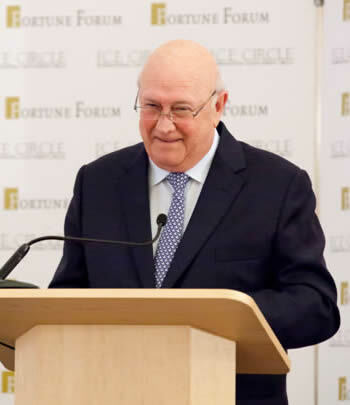 de Klerk and Nobel Laureate spoke as an African from Africa about the challenge of advancing human rights and freedoms in the continent he believed has tremendous potential in the world. With today’s growing populations and the growing gap between the rich and poor he addressed Africa’s untapped agricultural land and resources - he called for priority to be placed in Africa, an awakening giant. “Where conflict and violence persist, human rights suffer – The Promotion of human rights is a continuum – the first step is to establish peace and order –the second step is the establishment of good governance and economic and social development. Human freedoms do not flourish in conditions where large parts of the population subsist in abject poverty. Renu Mehta and fortunate friends saluted the work of the United Nations, the UN Foundation and some of their most passionate and inspiring advocates. ‘Making a profound difference to the lives of others is the expression that unites philanthropists, and it is the very spirit that Unites Nations; for all of our human diversity, the UN represents the global, the local and the truly indispensable’, said Renu. Ban Ki-Moon, Secretary General of the United Nations delivered a special video message to Ted Turner and congratulated him on his historic $1b gift ten years ago ‘Ted has delivered beyond anyone’s best hopes’, he continued ‘Let’s keep working together for a more peaceful, prosperous and just world’. Best Selling Author and UN Me ssenger of Peace, Paulo Coelho and Fortune Forum’s Senior Advisor, Jonathan Granoff were in dialogue to explore our inner journey and its relationship to generosity and giving. Paulo who has created his own foundation in Brazil said ‘Initially, I didn’t want to try and change the World or even Brazil but the journey began with changing our street and that is exactly where I started’. Jonathan questioned Paulo about his constantly used expression ‘fight the good fight’ which Paulo puts down to provocations, tests, self inquiry and the fundamental importance of love and sharing. Jonathan’s quest explained his quest to ‘unpack the truth’ and he urged us to constantly ask why and how in that order to make sure we do not pursue improved means to unimproved ends. Two Nobel laureate economists; Fortune Forum’s Policy Advisor, Sir James Mirrlees and Prof. Amartya Sen discussed development economics and the public-private partnerships necessary to achieve the UN Millennium Development Goals in this uncertain economy. Amartya and James implored international solidarity towards meeting the UN Millennium Development Goals, which Amartya referred to as ‘representing the true starkness of the world’. They discussed the Mehta/Mirrlees (MM) Proposal for donations and how it could free the needs of the poor. James said ‘Donors could get a better price for development; achieve more for their money and greater monitoring on the delivery on the goals that they choose to support. He concluded that ‘These aspects would make the scheme more attractive to investors’. 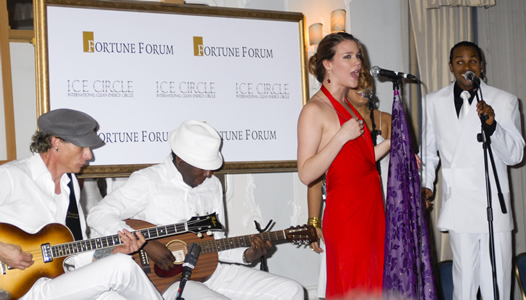 Actress, supermodel and L’Oreal spokesperson, Milla Jovavich introduced the finale; a special and fabulous performance by Grammy Award winning artist Joss Stone. Joss spoke of her ambition of being the first artist to ever bring true meaning to the term “World Tour” by playing concerts in everyone of the countries that comprise the United Nations and beyond mid 2010 and the London Olympics in 2012. The United Nations Foundation is an advocate for the UN and a platform for connecting people, resources, and ideas to help the UN solve global problems. 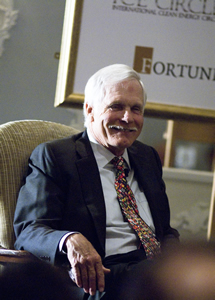 Established with Ted Turner’s historic and precedent-setting $1 billion gift, the United Nations Foundation is an advocate for the UN and a platform for connecting people, ideas and resources to help the UN solve global problems. The Fortune Forum would like to thank the UN Foundation and Amir Dossal, Executive Director of the United Nations Office for Partnerships (UNOP) with whom Fortune Forum works closely with together with the UN Millennium Campaign Office in support of meeting the UN MDGs. 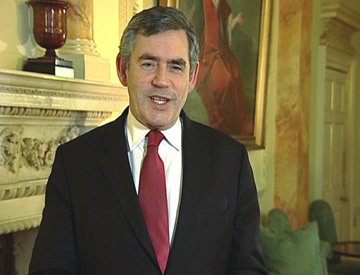 Prime Minister Gordon Brown opened the event by video address. He believes that the scale of the development emergency and the environmental challenge are such that we cannot now leave it to some other time or some other people and that this can only be achieved in a genuine partnership between the government, the private sector, NGOs and faith groups. The Hon Al Gore, Nobel Prize Winner 2007 delivered the keynote address. Prime Minister Gordon Brown passed on his congratulations again to Al Gore - on winning his recent peace prize and said that he has been inspirational in focusing attention across the globe on the issue of climate change. 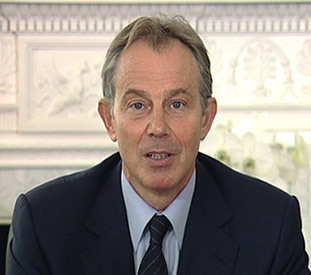 Former Prime Minister Tony Blair also passed on his congratulations and said that winning the Nobel was thoroughly deserved. Renu Mehta conveyed that the exalted human quality expressed through charity is founded on compassion, and when this is combined with practical programs, we can ensure sustainable development. So charity and sustainability are both important and this insight is the essence of Fortune Forum. Caroline Lucas MEP stressed the need to focus on want real, lasting, fundamental policy change, so we can address the underlying causes of poverty and environmental destruction, not just the symptoms. Daryl Hannah cautioned that our over-demand for natural resources is causing the wholesale destruction of life. 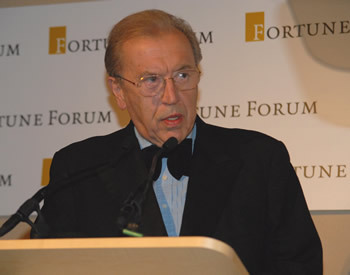 Sir David Frost stated that Cancer will affect 1 in 3 of us, supporting Cancer Research UK through the Fortune Forum Summit Event is an opportunity for us to make a difference. 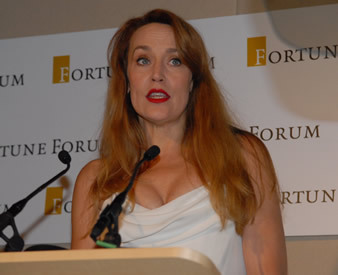 Jerry Hall as ‘Special Ambassador of The Alliance for a New Humanity’ expressed the gratitude that brightens the eyes of so many people who will benefit from our work together. 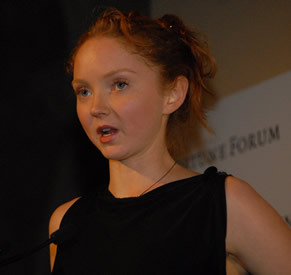 Lily Cole on behalf of WaterAid, talked about the dire situation in the developing world; 1.1 billion people still lack access to safe water in today’s times. Sir Bob Geldof was honoured with the British Red Cross Humanity Fellowship Award. 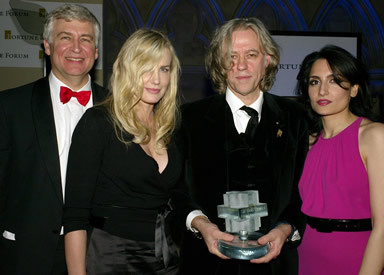 Geldof was given the award in recognition of his continued efforts over 20 years to promote humanitarian issues. The award honours those people who reflect the values of the Red Cross movement and have a long association with, and a dedication to, humanitarian work. The only previous recipients have been Nelson Mandela and Bill Clinton. Bob delivered a powerful acceptance speech echoing the urgency of moving forward, particularly with respect to Africa. Former Prime Minister Tony Blair said that there is no substitute for what governments can and must do to eliminate poverty. Similarly there is no substitute for what individuals and civil society institutions can and must do. Governments can only properly respond to the desires of the people. He expressed his deep congratulations to Bob Geldof on receiving The British Red Cross Humanity Fellowship Award and said that he deserves every bit of our praise and believes that he will continue to be a powerful effective advocate for programs which deserve our support. 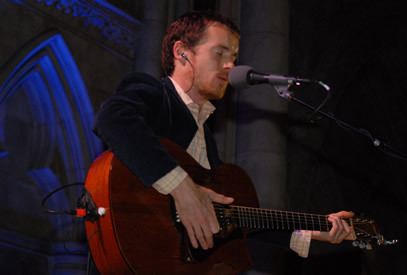 Damien Rice produced a beautiful philosophical sound and drew the evening to a poignant close. Fortune Forum honoured and identified compelling work that is being implemented by The British Red Cross, Cancer Research UK, WaterAid, African Renaissance and ICE Circle. Together, these 5 brands represent the global, the local and the strategic. So how can Fortune Forum work towards the shared and ultimate goal of scale, scale to reach the vast numbers who need help? We can, through our campaigning and our convening, scale up investment, and influence policy so that children have the chance of reaching adulthood and that our grandchildren have the chance to live in a clean environment. Fortune Forum has benefited from the reach and impact that our participating luminaries have brought to attract massive media coverage which has amplified awareness at the global level. This advocacy has stressed importance to both our supporters and policy makers at the political level. fund the projects which can transform our world. Former US President Bill Clinton was the keynote speaker and was honoured with the British Red Cross Humanity Fellowship Award. Michael Douglas, actor and UN Messenger for Peace, made the stunning presentation. For details of the presentation go to http://www.redcross.org.uk/news.asp?id=62350&cachefixer= The event highlighted the need to take action to tackle the pressing issues of global poverty, environmental sustainability and worldwide health to a glittering array of influential entrepreneurs, captains of industry, global leaders, media moguls and celebrity activists. The work of the British Red Cross, African Renaissance, WaterAid and Alliance for a New Humanity were showcased side by side on a shared platform to highlight these global issues which co-exist. These formidable organisations are working to actively find solutions to the most defining challenges of our time. The campaigning of which cannot be accomplished by one nation or one organisation alone. The evening raised awareness of, and funding for, many essential projects including emergency aid relief, notably buying ambulances for the British Red Cross, purchasing tree planting for African Renaissance and providing clean water projects for WaterAid. Deepak Chopra, the renowned spiritualist, to deliver his message of instilling a culture of peace. 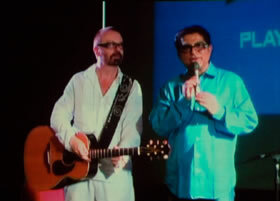 Deepak Chopra and Dave Stewart performed a special peace music jam. 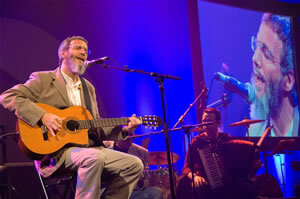 The guests were mesmerised by a much long awaited performance by Yusuf Islam, formerly Cat Stevens. He gave a poignant speech about his children’s charity, Small Kindness. What a finale to an evening of inspiration, entertainment and real pledges to actively contribute to the global efforts. Impersonators of 'The Rat Pack' smoothly rounded off the evening. Fortune Forum has benfited from the reach and impact that our partipating luminaries have brought to attract massive media coverage which has amplified awareness at the global level. This advocacy has stressed importance to both our supporters and policy makers at the political level. The event aimed to inspire and engage exceptional individuals and corporations to become drivers of social change and to compliment the work of major charities and governments in a powerful way. This launch event will serve as a prelude to more focused and intimate high-level events where these leaders can join forces to harness their power, ideas and influence.